Tunnel Vision because we got to experience tunnel vision in three big ways today as we biked through three very dark, long (3/4 mi) dripping, cold tunnels with no lights whatsoever in them. 400 because that is what they referred to this section of railway. It was 400 miles between Minneapolis and Chicago and the train could do the trip in 400 minutes! Sometimes exceeding 100 mph! 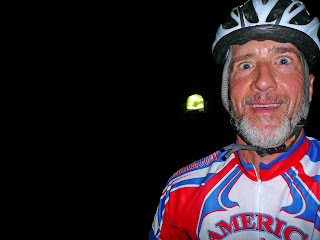 It seemed like a good allegory for our week… In 4 days we are doing over 400 miles. I think we’ll end up doing over 600 miles in 7 days. All personal records for yours truly. If it wasn't for the tunnels, we would have had to climb over all of the peaks above. With the tunnels we avoided 3 of the 4. Gerard wanted both experiences, but sadly only time for one...the tunnels. A great day of riding side by side with Gerard. Rich and Sarah rode with us for a while. Great scenery, first 40 all flat on a rail to trail bike path through 3 exotic old railway tunnels, followed by rolling hills and headwinds on a beautiful day. All that followed up with two nice boat tours of The Wisconsin Dells. Clear, blue skies. No hint of rain. A chill in the air for the morning (57 degrees). 10 mph headwinds from the North East most of the day. We have only had a few days with nice tail winds. The headwinds are winning. Everyone seems a bit tired from the big week of riding and it is not over yet. This week is basically four century rides in a row. I am amazed how good I feel and how much fun I am having doing this much riding day after day. Every now and then my rear end complains with some pain signals, but most of the time I find a position or two that feels very comfortable and I am able to just peddle away for hours and hours, enjoying the scenery or talking and/or talking with fellow riders. The ride today started out with Gerard and I catching up with Sarah and Rich. We rode with them for a while and then Bud and Cindy caught up with the four of us. Then the six of us rode the bike path to the first sag pretty much together. Somehow Gerard and I ended up leading the group. It was a nice social roll on a limestone hard-packed gravel path. The gravel slowed us a bit, but was a welcome change from playing dodge-em with semi’s. The last section of the ride ended up being just Gerard and I. He put me through my paces and we ended up at the hotel almost before the box. The rooms were not ready and the box was not ready to be unloaded. So, Gerard and I decided to tour the Wisconsin Dells and find out what they are all about. They were very interesting. We took two boat tours. One by a traditional tour boat of the upper dells. The second was a very enjoyable ride on an amphibious “Duck” boat of the lower dells….both the woods themselves and the waterways. I have some nice pictures you might want to check out in my slide show below. This is the photo that made the Dells internationally famous. Taken not by me, but Henry Hamilton Bennett in 1890 or so. The significance of the photo is that it was taken with the first "snapshot" lense, invented by Bennett. Prior to this invention all photo's were of still images. 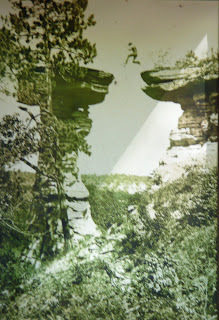 No one believed Bennett until he captured this shot of his 18 year old son jumping across Stand Rock adjacent to the river. It took 18 tries to get it right! Now that have trained German Shepard dogs that make the leap with a net under them, which Bennett's son did not have. This photo, when distributed internationally put the Dells on the map. 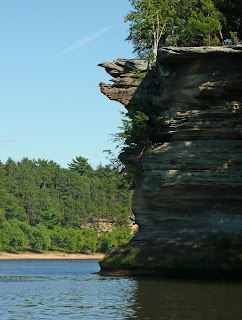 From our Duck boat we are show this sandstone formation that looks like a Hawk. What do you think? We come back, clean our bikes, get ready for dinner, eat, blog, talk to wives and go to bed.